Rotisserie Chicken. Regarding BBQ Inc.
Everyone knows how great rotisserie chicken is. The problem is, everyone buys it at the store when it is so much better made at home. Don't worry, it is also amazingly easy to make. Of course, a rotisserie kit is necessary, but it is a fantastic way to add versatility to virtually any grill. We know that grilling a whole chicken doesn't require a rotisserie, but as the bird turns, it self-bastes, making a more moist and tender meal. Do yourself a favor and get a rotisserie kit for your grill and try one or all of these great recipes. This great rotisserie chicken recipe became hugely popular along the East Coast of the United States a few years back. Known as Super Chicken, El Pollo Rico, or Peruvian Chicken, this is a tasty way to make a bird with enough flavor to satisfy anyone, but mild enough for everyone. Regardless of its authenticity, this is a great recipe, popular with all who try it. Love that rotisserie chicken you get at the store? Well, this is even better because you make it fresh, season it to your liking, and you get to watch it cook. Maybe we should call it "Better Than Take Out Rotisserie Chicken." This chicken has a great garlic and lemon flavor, complemented by the savory rub mixture. It has a great spice rub with a good dose of garlic to make it stand out. People will ask you to make this one again and again. This is a fork tender, delicious three pepper and herb rotisserie chicken. You can adjust the amount of cayenne pepper used in this recipe or substitute with a mild chili powder. The bacon and the butter help to keep this rotisserie chicken moist and give it an old world fire roasted taste. This is as traditional as it gets when it comes to rotisserie chicken. If at all possible, we really recommend doing this rotisserie chicken on a charcoal grill for that extra, smoky flavor. This Asian-style rotisserie chicken has a slightly tart, yet savory flavor. The citrus works by flavoring and tenderizing this chicken while the hint of Chinese five-spice powder gives it a unique distinctiveness. 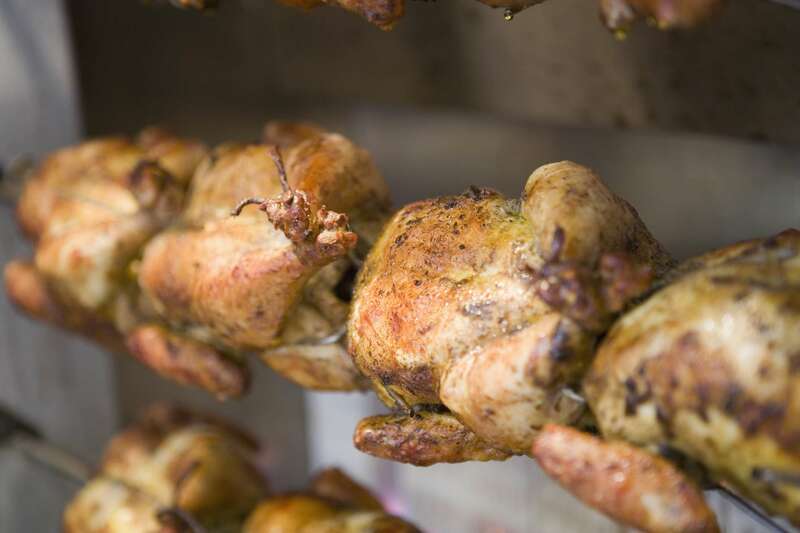 Instead of individual tandoori chicken pieces, try the whole chicken rotisserie style. The secret to this rotisserie chicken is in the mild, but flavorful Indian marinade, and the secret to the marinade is in the yogurt. Yogurt is slightly acidic, and that draws out the flavors of the spices and then holds them tightly to the chicken. Be careful loading this marinated chicken onto the rotisserie spit so as to keep as much of the marinade in place as possible. This will allow the marinade to roast right on the chicken. Here is another delicious rotisserie chicken recipe for you to try. The sweet sauce gives this dish an authentic Hawaiian flavor. You can serve this with grilled vegetables, like sweet potatoes or vegetable kebabs. This dish has a great south of the border flavor. The simple combination of lime and cilantro gives this rotisserie chicken a bright and light flavor that anyone will love. You can shred this rotisserie chicken and serve with warm tortillas and guacamole, or slice and serve with Spanish rice.